Photo: Teenagers are social creatures. Why not let them enjoy each other on top of a 10,000 foot ridge instead of a bunk bed in a cabin down in the valley? When they earn and work and suffer together, they just might be more likely to stick together. 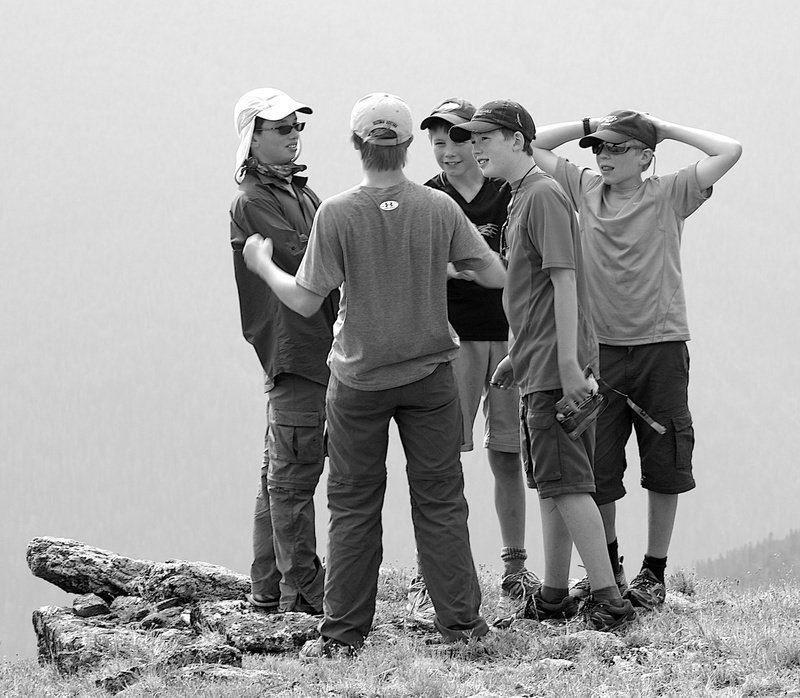 This photo features the high adventure crew from Troop 676 of Bozeman during our August 2012 traverse across the Spanish Peaks in the Lee Metcalf Wilderness of Montana, standing atop Indian Ridge listening to our oldest Scout tell an animated story about another adventure from the past. Usually it’s in the form of an excuse not to go on an outing, because maybe the outing activity just isn’t their thing. That’s why as a Scout leader you have to aggressively develop a sense of loyalty and brotherly love amongst your kids. Loyalty and love – both of which require self-sacrifice – are key ingredients to true friendships. Kids are learning about loyalty and love – they may not have a strong sense of what either really means. This is why I think high adventure activities in remote wilderness are an essential ingredient to a successful Scouting program. Wait – what does loyalty and love have to do with wilderness trekking? You see, when you drop kids into a wilderness, they are put in an environment without temptations for selfish ambition. In wild places, self-serving interests not only result in a failure in group dynamics, but a failure in self-gratification. Remember, Scouting is about cultivating the Patrol Method, which requires cooperation, and if that cooperation is missing, a lad will get mightily uncomfortable mighty quickly on a long trip in a wild place. But when they have a sense of love for each other, they see a need to serve each other, and they understand what self sacrifice means. Loyalty is a logical outcome – loyalty results from love in action. Some might say that loyalty leads to love in action. Maybe it’s a chicken-and-egg argument. It may not matter, because neither loyalty nor love should be earned, but given freely. The result of unconditional distribution of loyalty, service, and love? The building blocks for friendship, perhaps. Ryan Jordan is an Eagle Scout, a former High Adventure and Program Director at Camp Parsons (Chief Seattle Council), a former Scoutmaster, and currently – an Assistant Scoutmaster with Troop 676 in Bozeman, MT and the Montana Council BSA’s High Adventure Committee Chair. Ryan is a frequent author and speaker in a number of Scouting venues, and focuses his Scouting outreach efforts on preserving and cultivating High Adventure as a critical component in the development of Scouting’s young men.